A few weeks ago, I started a series called: Female Character Spotlight, where I highlighted the character Adora Belle Dearheart. My goal with these spotlights is to bring attention to realistic female characters, especially within the fantasy and sci-fi genres. I want to introduce you to amazing women, and girls, who are strong and weak, who are afraid and brave, in other words, characters who are so real and special that you can’t help but want to meet them. I also had originally intended to spotlight a character at least twice a month. I’m not sure I’ll be able to do that. I will commit to once a month, and if I’m able to do more, I’ll release them when I can. Today’s character comes from the talented author, Neil Gaiman. In which book does she make her introduction? 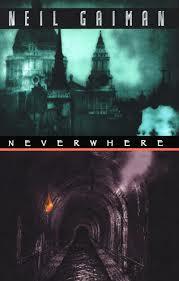 Neverwhere, written by Neil Gaiman. In the book, an ordinary man named Richard Mayhew finds a girl bleeding on the sidewalk. He stops to help her and is thrown into a world unlike any he’s ever known before. A world where the mundane and the unbelievable co-exist. On the run and exhausted. —Neil Gaiman, Neverwhere, (New York: HarperTorch, 2001), 6. Eldest daughter to Lord Portico, a late Lord of London Below, on a quest to discover who murdered her family. Including doors that do not exist. Uses breadcrumbs, instead of phones, to send messages to friends. Promotes recycling. Would make any second-hand retro fashion store proud with her ensembles. Why do you want her on your side in a post-apocalyptic world, or even the current mundane one? She’s not afraid to reveal her vulnerability. Not even embarrassed to weep, sniffle, or sob. Spends free time exploring by herself. She has the uncanny ability to know when the services of the best bodyguard in London Below are required. Senile nobility does not frighten her. When angels aren’t torturing her, they honor her with wine from Atlantis. When angels are torturing her, she’s strong enough to resist becoming a wailing ball of whimpering flesh. Carries a string in her pocket (Do you know what you can do with a string? There are approximately 12.2 thousand verified uses for a piece of string, give or take a few thousand). Has experience walking through caves, deep, dark tunnels and labyrinths guarded by beasts. Can solve riddles (What better way to pass the time?). Is uncomfortable walking across a thin plank of wood thousands of feet above a painful, and probably messy death, but does it anyway. Able to see the silver lining in everything, even a treasure that turns out to be a toad. Eating lunch with an obsessed hunter of mythological creatures, the most ordinary man in the world, and a soul-stealing seductress on the decks of a defunct gunship moored between Tower Bridge and London Bridge as if it were the most natural thing in the world. Where would I meet her for drinks? Why is she worthy of a spotlight? She’s a complex girl that isn’t over-the-top anything. She cries, but stands up to crazy Earls. She’s frightened, but brave. She’s weak, but strong. She’s as equally adept at destroying lives as she is at saving them. She’s not snarky, or obnoxious, or loud, or tougher than nails, or a temptress, or even a superhero. She’s you and me, and something a little bit less, and something a little bit more all wrapped up into . . . Door. Lovely tribute. I hadn’t thought about what a well-drawn character Door was before; generally, Coraline is the Gaiman character I first think of when I think of spunky-but-realistic female protagonist. Thanks! You know, I’ve never read Coraline. Just added it to my TBR list :). Gaiman has a lot of great female characters. I’m particularly fond of the completely bonkers Delirium from his Sandman comics, which also feature the eloquent, elegant Death. This is my third Gaiman experience, after Stardust and Good Omens. I’ve heard of the Sandman comics, but haven’t picked them up yet. Something to look into, thanks!